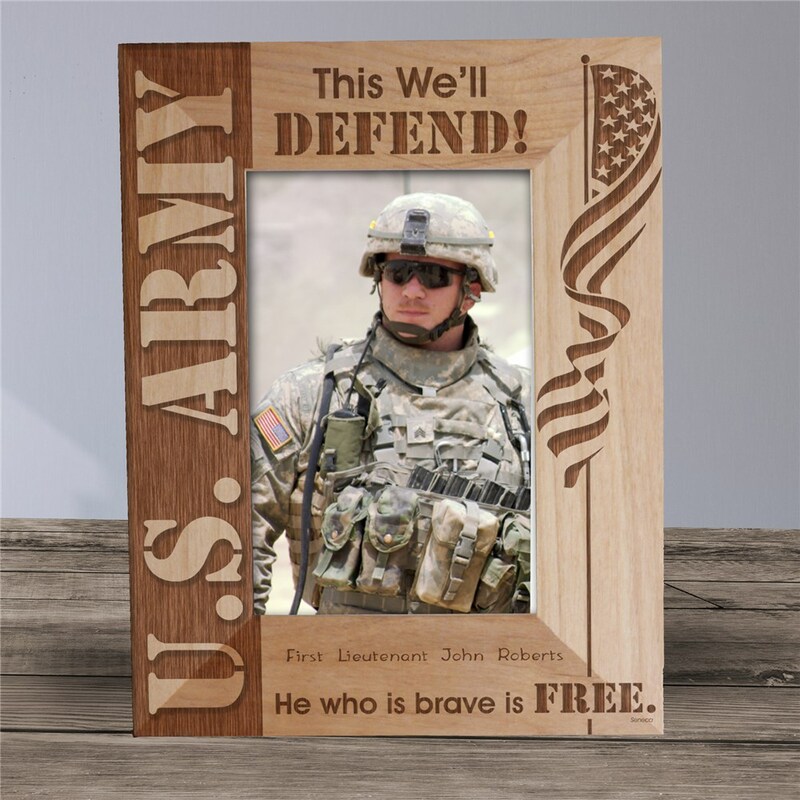 Proudly display your U.S. Army soldier in this handsomely engraved Army Personalized Wood Picture Frames. A unique personalized gift sure to bring a smile to your face and warmth to your heart. More than simply Personalized Wooden Picture Frames, these are a windows to your loved one in a far off place. 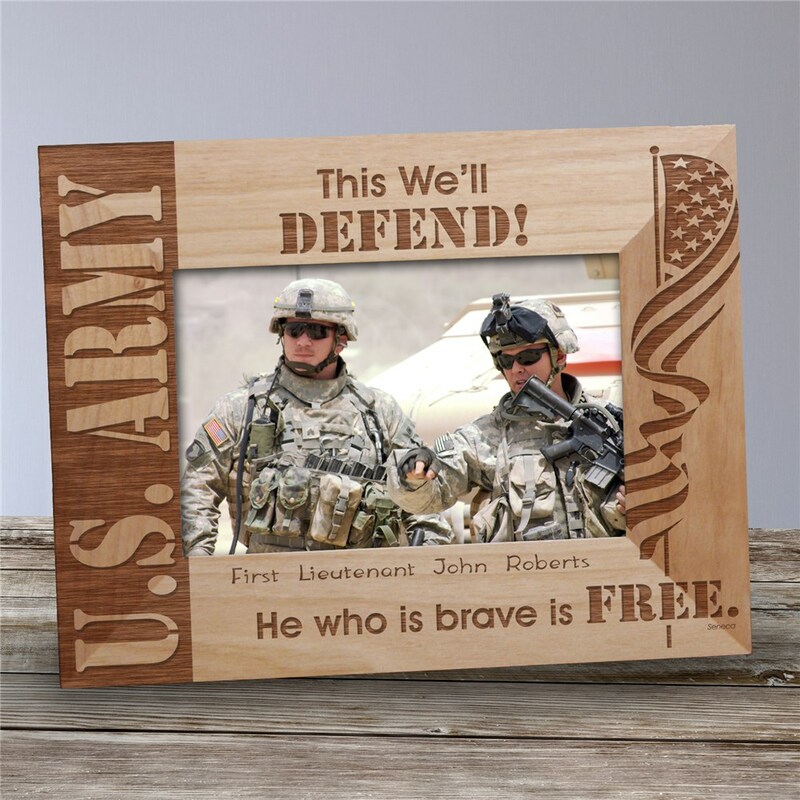 Our Personalized U.S. Army Wood Picture Frame measures 8 3/4"x 6 3/4" and holds a 3½" x 5" or 4" x 6" photo. Easel back allows for desk display. Includes FREE Personalization! Personalize your U.S. Army Picture Frame with any title and name. Personalized Frame is available in horizontal or vertical. He who is brave is FREE. - Seneca. I LOVED the fact that this frame can be personalized, and can be ordered either vertical or horizontally. Just placed a picture of my Sons US ARMY Graduation Picture into it and it looks GREAT !!!!! GiftsForYouNow.com has many Personalized Military Gifts for your favorite Soldiers. Select any of our Personalized Military Gifts today and we will personalize it for FREE. GiftsForYouNow.com also has a wide array of Personalized Patriotic Gifts for the 4th of July, Memorial Day and Veteran's Day.